REDOUTE'S CHOICE (AUS) (Bay 1996-Stud 2000). 5 wins-2 at 2, MVRC Manikato S., Gr.1. Champion Aust. Sire 3 times Sire of 1335 rnrs, 1007 wnrs, 160 SW, inc. Miss Finland (STC Golden Slipper S., Gr.1), Lankan Rupee, Melito, Master of Design, Redoute's Dancer, Stratum, Samantha Miss, Majmu, Fashions Afield, Musir, Nadeem, Mustaaqeem, God's Own, Lotteria, Wylie Hall, Gallica, King's Rose, Snitzel, Bonaria, Anamato, Howard Be Thy Name, Peeping, etc. Kifaah (g. by Redoute's Choice). 7 wins. See below. Tropicana Lass (f. by Redoute's Choice). Winner at 1200m in 2017-18 in Aust. Kadota (f. by Snitzel). Winner at 1600m in Aust. No Delay (g. by Charge Forward). Winner at 1400m in Aust. WANTED (Fastnet Rock). Joint Third Colt on 2009-10 Australasian 3YO Classification. 3 wins-2 at 2-at 1100m, 1200m, A$1,216,000, VRC Newmarket H., Gr.1, AJC Kindergarten S., Gr.3, STC Pet & Animal Show 2YO H., 2d VRC Patinack Classic, Gr.1, Lightning S., Gr.1, MVRC William Reid S., Gr.1, VRC Danehill S., Gr.2, 3d MRC Schillaci S., Gr.2, AJC Canonbury S., L, 4th AJC TJ Smith S., Gr.1, MVRC Manikato S., Gr.1, MRC Oakleigh P., Gr.1. Sire. SHRAPNEL (Charge Forward). 3 wins-1 at 2-at 1200m, A$293,935, SAJC Yallambee Classic, Gr.2, Breeders' S., Gr.3, MVRC TEAC Audio Visual Spectacular P., 3d VRC Coolmore Stud S., Gr.1, SAJC Queen Adelaide S., L. Sire. INTERSPERSED (Sebring). 2 wins at 1300m, 1400m, A$133,050, Canberra Guineas, L, 2d ATC Membership on Sale H., 4th Illawarra TC Keith F Nolan Classic, Gr.3. Cana (Fastnet Rock). 3 wins to 1400m, A$203,435, to 2016-17, ATC Bradford Soundscreen H., Bowermans Furniture H., 2d MRC Foundation H., MVRC William Hill H., 3d MRC Kevin Hayes S., Gr.3, 4th MRC Angus Armanasco S., Gr.2. I'm Yours. 4 wins at 1200m, 1350m, QTC Shail H., BTC QRU H., 2d AJC Cabravale Diggers Ern Kavanagh H. Producer. INTO THE MIST (Redoute's Choice). 5 wins from 1200m to 1600m, A$229,580, SAJC Queen of the South S., Gr.2, Schweppes H., Eddie the Eagle H., William Hill H., 2d MRC Ladies Day Vase, Gr.3, SAJC Laelia S., L, 3d MVRC Adapt Australia H., 4th SAJC Adelaide Guineas, L.
INSTINCTION (Exceed and Excel). 4 wins to 1500m, A$274,160, VRC Hilton Hotels S., L, MRC Weekend Hussler S., L, Zeditave S., L, 3d VRC CS Hayes S., Gr.3, MRC Regal Roller S., L, 4th ATC Maurice McCarten S., L. Sire. Granma Gertey (Danzero). Placed at 2 & 3, 2d MRC Blue Diamond Preview (f), Gr.3, Quezette S., L, 3d VRC Heaven Extras Plate H. Producer. Danazar (Danzero). Winner at 1200m, 2d SAJC Alcohol Go-Easy S., L, Made of Gold H., Sajc.com.au 2YO H., 3d SAJC Aristocrat Bushranger H., 4th SAJC Sires' Produce S., Gr.3, Oaklands P., L.
Race Record: 35 Starts 7-6-5 A$201,363. 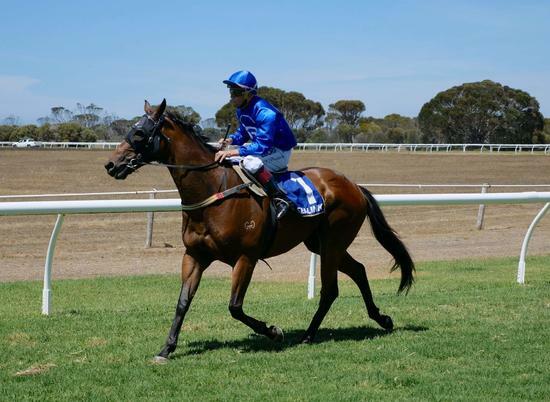 7 wins from 1300m to 1600m, A$201,363, to 2017-18, MRC Thebigscreencompany.com.au P., 2d MRC Inglis Cup, SAJC Mac Drink Driving Grow Up H., Darwin TC Minister's Cup, 3d Alice Springs Cup, SAJC Kevin Woods Retirement H., MRC Grand Hotel Frankston P.